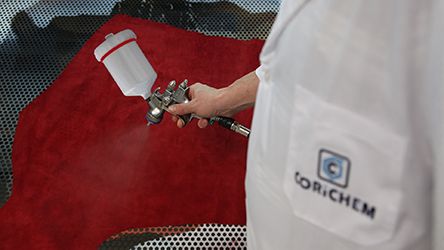 WET END PRODUCTS | Corichem S.r.l. Corichem produces the entire range of products used in the wet phase: from the Beamhouse phase to tanning, re-tanning, dying and fat liquoring processes. The constant research of new products, custom made to meet specific requests, is carried out in the Research and Development laboratory. The Beamhouse cycle consists of: soaking and liming phases. This serves to rehydrate preserved leathers and to remove all superfluous substances such as hairs, tissue residue and excessive natural fat. The soaking process has the specific function of rehydrating the leather fibres that have lost moisture during the preservation procedures, furthermore this is necessary to cleanse the leather from blood residue, excrement, and dirt in general. The liming process has a double function: the elimination of hairs and calcination of the leather as well as the depilation of the leather and the cleansing of the superficial layer, thereby eliminating the epidermis. The second is to limit the alkaline swelling in the leather where the collagen relaxes and dilates the fibrous structure of the leather. The tanning cycles consists of the: deliming, bating, pickling phases and the tanning cycle, itself. With the deliming process chemical substances used in the Beamhouse cycle such as limestone and sulphide are eliminated as well as proteinaceous products formed during the liming process. In this phase, there is also a reduction in the swelling of the hide. The bating phase, carried out with pancreatic enzymes, relaxes the leather fibres due to the partial elimination of a protein, namely, elastin. The pickling stage is a procedure where by using salt and acidic substances, the leather is made more reactive for the next tanning phase. The tanning cycle is the most important procedure in the treatment of leather. In this phase, the leather is preserved to avoid putrescence by using chrome salts trivalent in the mineral tanning and vegetal extracts in the vegetal tanning. The wet end cycle consists of three phases: re-tanning, dying and fatliquoring. In the re-tanning phase the final desired characteristics are produced, it is consequently formulated according to the use it is intended for. The dying process, due to the colour used, represents a purely aesthetic aspect of leather, it is nevertheless, of great importance in the fashion industry. The procedure is carried out in an aqueous phase with soluble organic colourants that are fixed to the leather by increasing the temperature of the dye bath and the use of acidic substances, which lowers the pH of the leather and of the bath. The fatliquoring process has the purpose of softening the leather, depositing lubricant chemical substances in the inter-fibril spaces that give the requested soft touch to the final article.